Russian defense ministry issued a warning to the United States, saying any coalition aircraft east of the Euphrates would be treated as targets and tracked by surface to air missile units. Russia also suspended the direct communications channel set up under Obama's rule to prevent such confrontations. 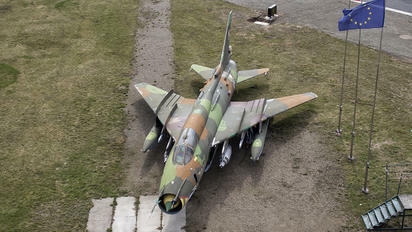 The US military did not use the channel prior to shooting down the Syrian Su-22 fighter-bomber [photo: Polish Air Force] according to Russian officials, who accused the US of "deliberate failure to make good on its commitments". They also equated the attack with aiding the terrorists operating in Syria. The US supports anti-government rebels that includes fighters aligned with ISIS. The Syrian jet dropped bombs near coalition forces fighting to dislodge ISIS from Raqqa when it was attacked by a F/A 18E Superhornet. A UN observer reports that the coalition's air offensive in support of Kurdish fighters is killing a "staggering" number of civilians. The independent monitoring group, Airwars, found the US coalition killed between 348 and 521 civilians in May alone, a rise of almost 20 per cent on the previous month. Reports from the front also say white phosphorus, an incendiary that burns on contact, is used by the US led coalition. ISIS holds thousands of civilians hostage in its self-declared capital. Under a hail of artillery fire and air strikes Kurdish forces have captured outlying parts of the city. Fighting will intensify as they move towards the center. This news created by his generals* must be welcome relief to the Current Occupant who is fighting to keep his administration from sinking beneath a deluge of political scandal related to his Russian Connection. Washington will be temporarily distracted out of its wits as the confrontation in Syria over the civil war reaches a dangerous flash point. *It would not be the first time in American history that the Deep State created an incident in pursuit of its policies. See Chapter Four, JFK and the Unspeakable, for an account of the military coup against South Vietnamese president Ngo Dinh Diem. Kennedy had decided by October 1963 to remove American forces from Vietnam; he ordered the military to draw up the plans. But his withdrawal was thwarted when the bombing of a shrine in Hue killed many Buddhists. Buddhists claimed that Diem regime was responsible for the attack. The CIA under Allen Dulles had extensively infiltrated the Diem government at all levels. Political unrest in the country created by the incident made withdrawal politically unacceptable. The Deep State wanted to continue the fighting in South Vietnam and even expand it. Diem and his brother were assassinated by coup leaders after the US gave them the green light. After Kennedy was murdered in Dallas, President Johnson massively increased direct American involvement in Vietnam's war of liberation. The rest is history.